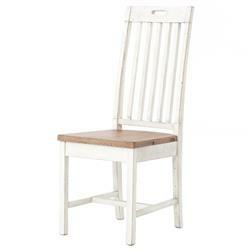 Natural and neutral, these modern classic dining chairs add country chic to any transitional space. Eco friendly FSC certified woods are crafted to produce a clean, simple form. Vertical lines, a natural driftwood seat and a casual white wash combine to create seating that brings a vintage modern vibe to the table.